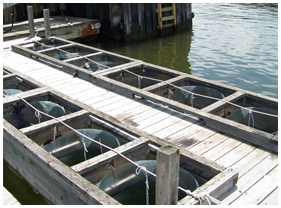 The Great South Bay once sustained very productive and lucrative oyster and clam fisheries, that collapsed in the mid-1970s. 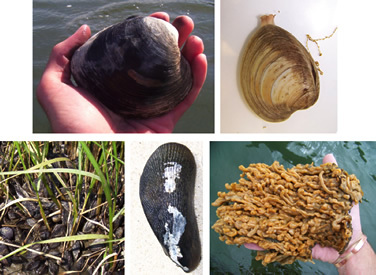 Clams, mussels and other shellfish are suspension feeding organisms that generate feeding currents of water that pass through their bodies, and trap planktonic microorganisms that serve them as food. At high densities and at an ecosystem scale, these organisms can have a tremendous impact on the amount of particles in suspension, and modulating the composition of planktonic microorganisms in the water. Since the demise of the hard clam fishery, novel and noxious planktonic microorganisms (such as brown tides) started thriving in Great South Bay. Our research focused on the role of benthic suspension feeding animals in modulating composition, trophic structure, and ecological processes in the planktonic food web at current and hypothetically-increased population densities. Our experimental approach consisted on mesoscale (0.4 m3) field incubations of natural plankton, that incorporated commercial (the hard clam, Mercenaria mercenaria) and non-commercial bivalves (the ribbed mussel, Geukensia demissa), and a recently introduced invasive colonial ascidian (Didemnum vexillum). 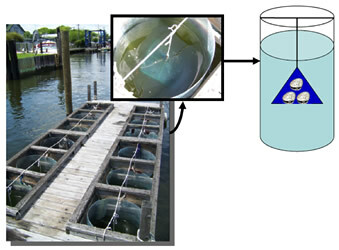 All three experimental organisms are suspensivores that live attached or inmersed in the bottom of coastal bays (called benthic). The effects of these organisms were studied at varying densities, separately or in conjunction, to assess their potential ecological effects. 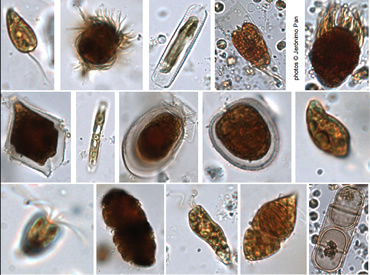 The response of several plankton components (bacterioplankton, picocyanobacteria, picoeukaryotes, auto- and heterotrophic nano- and microplankton, and micrometazoans) was studied with new and traditional analytical methods such as flow cytometry and microscopy. Our findings show that benthic organisms had marked effects on the plankton of Great South Bay. Of special interest are some interactive effects on the structure (biomass, species succession) and functioning (primary productivity and secondary productivity of nano- and microheterotrophs) of the plankton community.